Media: Soft cover, landscape format, 50 pages plus covers (incl. 2 pages in full colour). Advantages: Compact and useful format for modellers; packed with helpfully captioned photos; attractive cover art - front and back; supporting narrative text; ten colour profiles. The last few years has seen a boom in the availability of VVS aircraft of the Great Patriotic War. One of the surprises has been the release of different versions of Pe-2 kits from both HiPM and MPM in 1/48 scale. Both these models are quite nice, with the HiPM kit in particular being of a high standard. One of the challenges has been finding English language reference for this most abundant of all WWII Soviet bombers. Squadron's latest "In Action" title supplies an economical primer to the subject of this important aircraft. In common with the other "In Action" releases, "Pe-2 in action" summarises the development, variants and operations of the sleek bomber in 50 landscape format pages. The text is quite succinct and informative, but the 90 captioned photos provide plenty of inspiration for the modeller. The last six pages of the book detail experimental versions of the Pe-2 including a ski-equipped aircraft, a Pe-2 with a pulse-jet, an ejection seat test bed and a proposed fighter variant. The centrefold contains ten colour profiles of Pe-2s in Soviet, Bulgarian and Polish service. Don Greer's front cover and two profiles on the back page are as attractive as always. This book is an inexpensive introduction to this significant Soviet bomber. 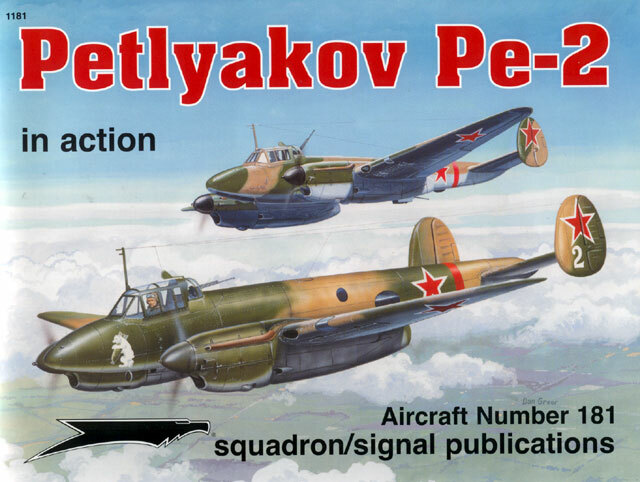 It will be an essential reference source for any modeller building a Pe-2 in either 1/48 or 1/72 scale.